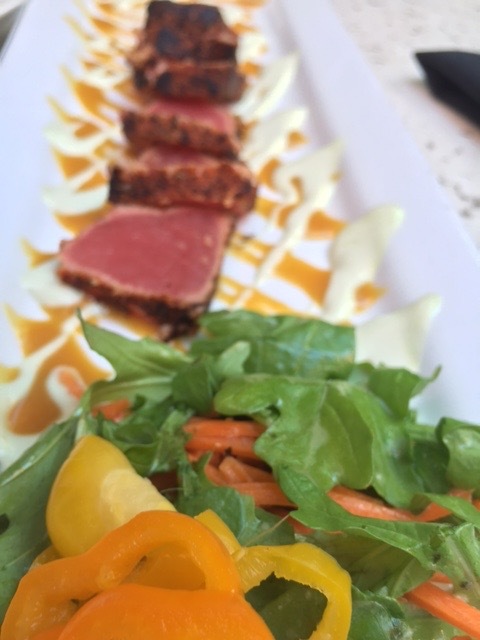 Ahi Tuna from Henry’s Tavern. I’m a huge fan of beer so when I got invited down to try Henry’s I was in! The beer list is extensive. It’s divided up by kinds of beer. Say you are an IPA drinker like myself, then you skip past Lagers, Wheat Beers and go straight to the IPA page. Not only is this list large, but there are also many seasonals on another sheet. All that to say, lots of choices here. 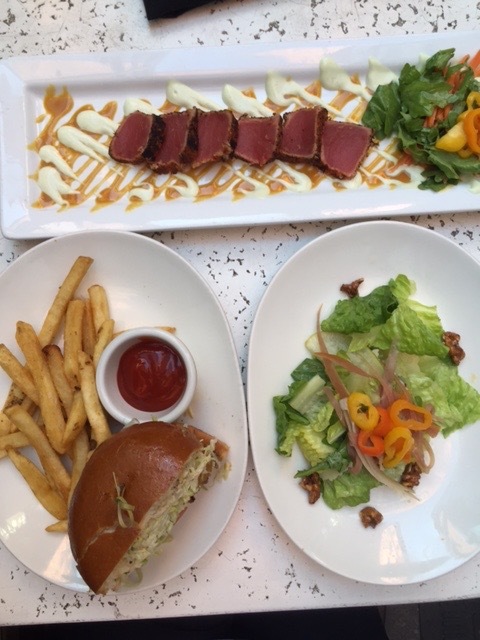 For dinner we chose the Cheddar Burger, a Pear and Walnut Salad and the Seared Ahi Tuna. Since we wanted to try a few different things, so we just shared it all. Luckily my husband and I like our burgers done medium, so there was no fight there. It was a good substantial burger. With all the other goodies it was nice to share it. My husband really liked the salad. 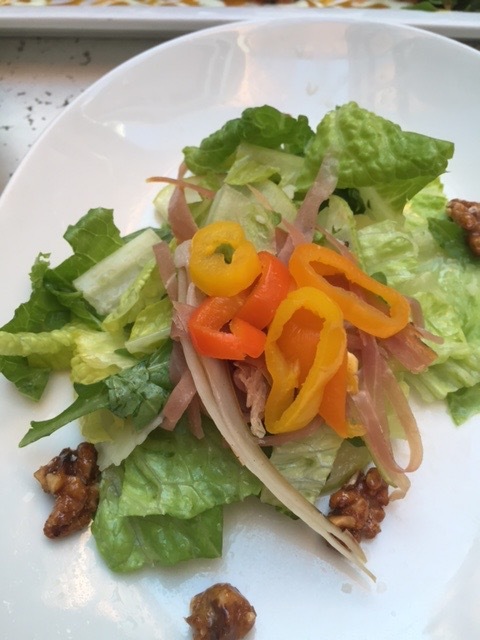 It had a Jalapeno pear vinaigrette. It wasn’t my favorite, but he did enjoy it. The Ahi Tuna was fabulous. We are suckers for Ahi Tuna and the seared crust was done well. All in all we really enjoyed Henry’s Tavern. We sat outside in the patio off the bar and enjoyed a beautiful summer night. Atmosphere was very dark, cozy. The bar has a trough in which you can put your beer to keep it could, plus it’s mighty active in there. Services was great. Our gal was working her tail off, but never missed a thing. 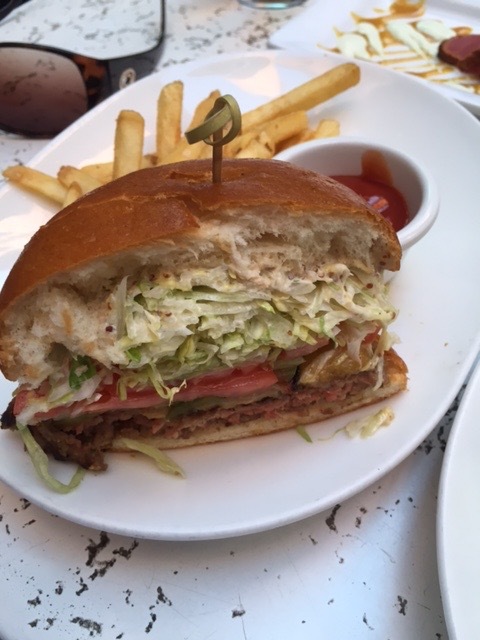 Prices were $14.95 for Ahi Tuna, $12.95 for the burger. Beers ran around $6 each. Must not miss item? Well the beer of course. 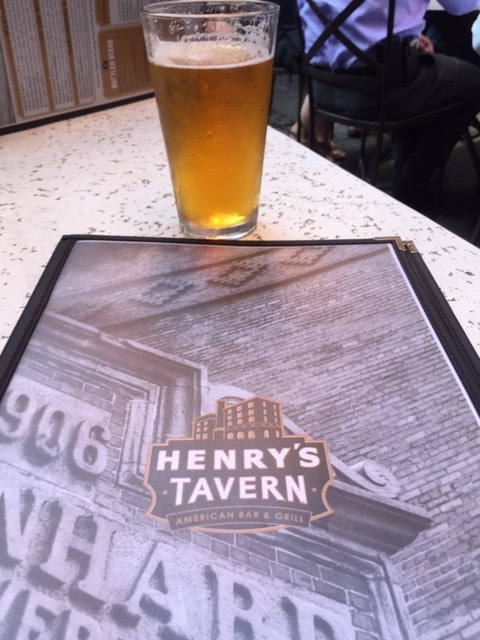 Henry’s Tavern is located in the Pearl, but there is also a location in PDX. If you havent already, you should try Portland City Grill. An amazing restaurant with the best views of the city. Great happy hour with an amazing atmosphere and delicious food. Just a suggestion, thought you might like to try it! We have been to Portland City Grill, it’s been years, but they did have a great happy hour and I hear it’s still pretty awesome.